Please welcome David Walton back to the blog! His new book, Superposition, just came out this month and he stopped by to answer a few questions about it, and more. Also, courtesy of the lovely folks at Pyr, we’ve got 2 copies to giveaway to 2 winners, and it’s open internationally! Your new book, Superposition, is described as “A mind-bending, near-future, science fiction technothriller.” I’m in. Will you tell us a little more about it and what inspired you to write it? I’d love to! Superposition is about a father and daughter, on the run and in danger for their lives. The trouble begins when a former colleague shows up on their doorstep, frightened of something he can’t explain and demonstrating a remarkable new technology. When he turns up dead that night, the police want explanations they are unable to give. Pursued by the law and by a quantum intelligence unconstrained by the normal limits of space and matter, father and daughter have to pick up the pieces, following multiple paths of possibility to get to the truth and put their lives back together again. When I started this book, I wanted to write the kind of story that ties your mind in knots, where each revelation uncovers a new layer of the mystery until the entire truth is revealed. But that’s easier said than done! Two things happened to spark the initial ideas for this book. One, I was reading books about quantum physics (more on that in a bit), and two, I served on a jury for a truly dramatic trial that involved murder, espionage, faked death, insurance fraud, and a secret mistress with Russian mob connections. None of the details of that trial made it into the book, but I was fascinated by the process and by how the details of the story unfolded in the courtroom. You’re an engineer, and quantum physics play a big part in this book. What kind of research did you do for the book? Before I started writing the novel, I was reading some quantum physics books for my own enjoyment (and with the thought that a story might come out of it). The subatomic world is compelling for how truly unintuitive and surprising it is, and a number of the things I learned from the books I read were concepts I had never seen used in science fiction before. I enjoy the role of reading about a subject, boiling out the most fascinating bits, and working them into a story. Why do you think readers will root for Jacob? I root for characters I care about who face loss and danger. I care about characters who are flawed, but who face up to their flaws and make hard choices. Jacob’s family is torn apart and his life destroyed through no fault of his own. He’s falsely accused and on the run, the victim of the foolishness and malice of others. The only family he has left is his daughter, Alessandra, with whom he has not always had the smoothest relationship. Faced with their mutual grief and danger, however, the two push past their differences and learn to appreciate and trust each other. Together, they face overwhelming challenges, but face them with bravery and self-sacrifice. The Kelley family. With the exception of his second daughter, Jacob’s wife and children are minor characters, but they drive much of the emotional stake of the novel. I have seven children myself, ranging in age from a year and a half to fourteen, and a lot of the chaos and liveliness of my own family life went into my depiction of the Kelleys. When you start writing a book, do you already know how it’s going to end, or do you let the narrative evolve organically? Can I say both? I always have some idea of how a book is going to end, and I do make a preliminary outline before I start writing. Once I get started, however, it inevitably changes, often in drastic ways. I can’t imagine a whole novel, in all of its details, before starting to write, and new ideas occur to me all throughout the process. Besides, even if I could figure it all out ahead of time, I wouldn’t want to. The experience of writing, to me, is very much like the experience of reading, except that I’m in control of the direction of the story. If I already knew everything that was going to happen, I wouldn’t enjoy that experience nearly as much. It’s been a while since we caught up. Have you read any good books lately? Are there any that you’re particularly looking forward to this year? I’ve been reading a lot of Daniel Abraham lately, both his Dagger and Coin series, as well as the Expanse series he’s writing with Ty Franck as James S. A. Corey. I can’t recommend those books enough, and both of those series have a new book coming out this year. There are also new novels coming from Neal Stephenson and Robert Charles Wilson, whose previous books have been among my favorites. The next book from me to appear in stores will be Supersymmetry (on sale in September), which is a loose sequel to Superposition. It follows the lives of several of the characters fifteen years later, and explores some of the implications of how Superposition ends. That book is already written, and will be released this September. I’m writing a new novel, unrelated to previous books, but I’m not ready to say much about it yet, except that it’s about code breaking . . . and intelligent fungi. A Mind-Bending, Near-Future, Science Fiction Technothriller. 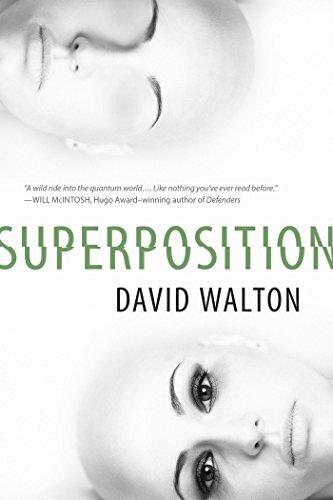 david walton, giveaway, interview, Superposition. Catching up with Tim Lebbon, author of The Silence (and a Giveaway)!